The example lessons are designed to help promote learning and application of the 8 science practices. The example lessons span various grades and science topics. The site includes 3 type of example lessons: Text-Based, Video, and Lesson Adaptation case studies. On this page the example lessons are organized by focal science practice, but you can also find them organized by the 3 groupings in the Example Lesson drop down menu. 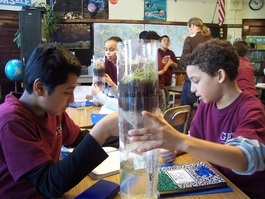 The example lessons can be used as part of a conference or professional development in which teachers identify the target science practices before examining the commentary on the website.